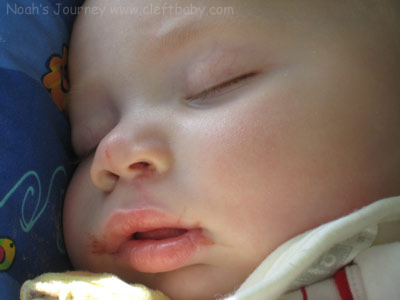 We had gotten through Noah's cleft lip repair without much issue. He had been uncomfortable, but it wasn't nearly as bad as we had expected. We had returned to our typical routine, new NAM in place. Noah's lip had healed beautifully. This time I was convinced I was going to be calm, we had been there already and all went well. However I found myself a complete nervous wreck a few days before palate repair. It was just heart wrenching to know we were going to put him through another surgery. For a moment, it felt rather wrong and just so foreign. He was just 8 months old and having his second surgery in his short life. He was a tough little guy, he took these surgeries far better than I could have ever imagined. On a cold, February morning, we arrived at the hospital ready to hand Noah over to his wonderful cleft team. Sitting in preop was when reality hit. This was it, round two. My hubby wasn't there with me since he was taking the older children to school. There I was, realizing I was going to have to give my little guy to the surgery team. Alone. It was a scary moment for me. My husband Tommy had been my rock. I wasn't sure I could get through the hand off alone!! But I did and it went well. Noah smiled happily as the gentle nurses carried him away. Thankfully Tommy arrived just as the long 3 hour wait started. Noah came through the surgery just fabulous! The surgery was successful and 138 stitches later, his palate was closed. Another moment of sheer awe in seeing the amazing skills of his surgeon, Dr. Rozzelle. She had done it again. What seemed to be such a challenging task to me was nothing but routine to her. Dr. Rozzelle used a technique that was explained to us as closing Noah's palate layer by layer, one at a time. Each layer perfectly stitched to heal into a near normal palate. She had to close his palate from his gumline all the way back through the soft palate, then all the way up through the nasal cavity. There was much work to be done, but she had done it. When we finally got to see Noah, he was wide awake and crying for his mommy or daddy to hold him! Once he had a familar face, he calmed right down. We were equally as happy to see him. 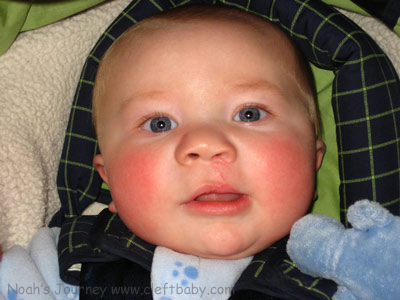 Noah's little face was rather swollen, with cheeks similar to a squirrel collecting food for winter. It never gets easier to see your child come out of surgery and be in pain. But the learning curves from one surgery to the next were big for me. 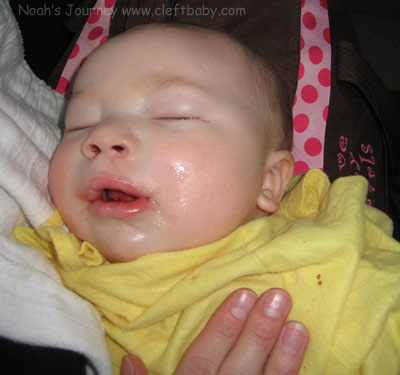 Noah had morphine until evening when they switched his medication. I learned quickly to be his advocate for medication. I watched the clock, took note of time and medication given to him. Called the nurses when it was nearing time for another dose to make sure more medication was coming. Staying ahead of the pain with the proper medication was key. This time I also learned that a Sleep Sack was a really great option while in the hospital. Noah had his IV in his foot, so the zipper going from top to bottom on the Sleep Sack made it super easy to have the IV and any chords come out the bottom. He was warm enough, I didn't need to pull anything over his head and it was so much easier to work with in a hospital setting. Eating proved to be another challenge. Before palate repair we had been told no more bottles post palate repair. So we armed ourselves with many sippy cup choices. The one Noah had loved before surgery wasn't the one he chose after the surgery. Eating was not easy for him and rightfully so. I didn't blame him for not wanting to eat. But he needed that food to heal. The first few days post palate repair were filled with different attempts to keep him full. We did a medicine dropper with formula, a cup, a syringe, a few sippies and not much luck. But then by day 3 post up it was as if the pain had lessoned enough for him to really start to eat. Once that happened, he was well on his way to feeling like himself again. He ate and slept, then ate and slept some more. A week post palate repair he was crawling around and playing like his typical self. As if nothing new had been going on the last week. Not all babies bounce back so fast, but we were blessed that Noah did. Not only did he feel better, but now he had this beautiful palate carefully created by Dr. Rozzelle. His clefts were fully repaired so we could move forward watching our boy grow, with no other surgeries planned until he got older.